First off, let me say that i love the name of the record label here: Pancake Assassin. That is just a really nice turn of phrase. 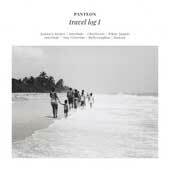 Panteon is the project of Yvonne Ambrée, from Brooklyn, formerly of folkish duo Take Berlin. This is her debut solo release. The number I at the end of the title leads one to believe that there is more music coming. And that is a good thing, because Ambrée has made an engaging debut EP. January Keeper kicks this off with a picked guitar that echoes and chimes like something Maurice Deebank might have played. Ambrée sings delicately over this as the song meanders. Then, at just under two minutes along, a chugging drum beat lumbers in, joined by keyboards, and a backing voice that adds, faintly, to hers. This is very pretty. She follows this up with Interlude - Charlevoix which is exactly what it says it is: twenty seconds of field recording. A violin sounds faintly in the distance, and then a voice on a loudspeaker -- but far away so that it is just a faint rumbling. We have another interlude next, Interlude - San Victorino. This is an acoustic guitar and a voice in Spanish (i think -- it's not the clearest recording), but kind of far off and slightly out of focus. The oddly titled DBallyvaughn is next, a tune of Ambrée's delicate voice backed with piano. About halfway through the guitar picks up, a horn wanders in, and a skittering beat comes by. After a bit of funkiness, the beat ends and the song winds to a close with horn and piano, another slow jazz reference. Hudson starts with a picked guitar that reminds me of July Skies, a slow electric picking as she sings. Her voice is very close here, in front of the guitar, almost like she is singing right in your ear. But the song is light, with faintly glowing keys and light layers of voice. Travel Log I is a very pretty EP that reminds me a lot of the mid-2000s Make Mine Music scene and, at the same time, like 1970s pop like i used to hear on the radio when riding in my mother's sky blue Oldsmobile as we drove to the A&P in the small town we lived in in central Ohio. Something in the tone here brings me back to a very specific time in the last century when i was very young, and i am not sure of the names of the artists that Ambrée reminds me of. Some 1970s stuff that i found pretty enough at the time, but not engaging enough to track down. But i like what Ambrée is doing here. I like that she takes the lush 1970s-ness and add in clear guitar and electro beats a la mid-2000s, with a smattering of jazziness over it. Very nicely done. I am already looking for to volume II in this series.